Toyota Europe is running “Stories of Better”, an online series of animated short films featuring real-life scenarios. Twitter fans are encouraged to share their stories using the #toyotastories hashtag. Launched at the 2012 Paris Motor Show, the campaign began with four commercials produced by BlinkInk and Hornet directors: “Stories of Better”, “The 27 1/2 Year Journey”, “The 1,000,000 km Courier” and “Think You Know Hybrid”. The campaign continues with two films launched at the 2013 Geneva Auto Show: “Love in One Mile” and “The Outside Car”, produced by teams from Imaginary Forces, Supergoober, Rokkit and Sehsucht. Stories of Better, created by Sumo Science, introduces Toyota’s concept of “Always a Better Way” in a colorful and dynamic stop motion animation bursting from the pages of a pop-up story book, exploring the ingredients that make up Toyota’s latest models. “Love in One Mile” features the charmingly accelerated love story of Julia and Simon. We’re introduced to Simon’s instinctual approach to life, not only in choosing a soul mate, but also when choosing a trusted automobile. Simon McHugh is a man who knows what he loves, and one mile in the driver’s seat is all it took for him to know he loved the Toyota GT86. With its low centre of gravity, grip and steering to put him back in touch with the road (on a mountain in the shape of a heart), it’s no wonder why. “The Outside Car” features Marco Dottori who as a boy loved being outside. Marco grew up into a man who spent all day inside. That was, until he discovered the Toyota RAV4. As its AWD capability makes it a breeze to tackle any terrain, it put the joy back into his driving and the spirit of adventure back into his life. “The 1,000,000 km courier” features Danish courier Per Kongstad Petersen, who’s just completed 1,000,000 km from behind the wheel of his trusty red Toyota Hiace. “Think You Know Hybrid” is Toyota’s story of better, featuring the use of hybrid technology on the race track. 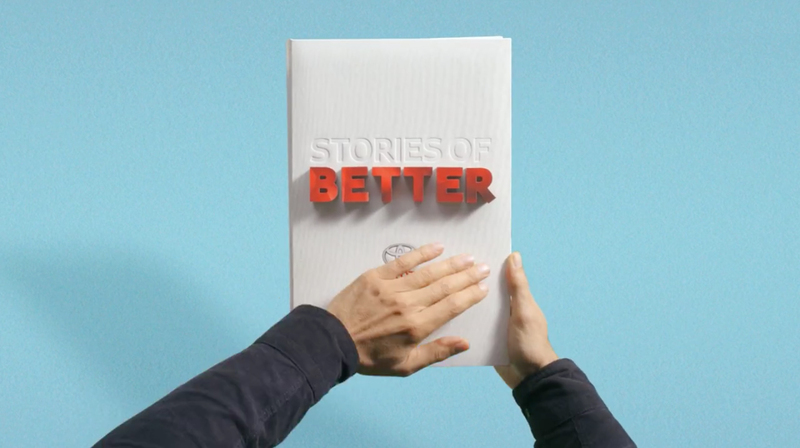 The Stories of Better campaign was developed at Saatchi & Saatchi London by creatives Adrian Caddy, William John and Matthew Guy, agency producers Mondi Howard and Anne O’Neill. “Love in One Mile” was produced at Imaginary Forces, Los Angeles and New York, and Supergoober, London, by creative director Michelle Dougherty, art director Joan Lau, designer Pete McDonald, lead animator Gary Hebert, animator Eric Demeusy and producer Christopher Ahn. “27 1/2 Year Journey” was directed by Major Briggs (Yulian Sanchez Ojanen and Daniel A Söllscher) via BlinkInk with producer James Stevenson Bretton. Post production was done at WAM London. “Stories of Better” was directed by Sumo Science via Hornet, with executive producer James Stevenson Bretton and producer Julie Crosbie. Post production was done at MPC and WAM London. “Think You Know Hybrid?” was directed by Gabe Askew via Hornet with executive producers James Stevenson Bretton and Jan Stebbins, producer Zack Kortright. Post Production was done at Hornet and WAM London by supervising technical director Sang-Jin Bae, editor Anita Chao, CG lead Ylli Orana, animator Sean Thorpe, CG generalist Rich Kim, 2D animators Anne Calandre and Jacob Kafka, modeler Meghdad Asadilari and compositor John Harrison. “1,000,000 km Courier” was directed by Yves Geleyn via Hornet with executive producers James Stevenson Bretton, Jan Stebbins, producer Zack Kortright, supervising technical director Sang-Jin Bae, live action producer Joel Kretschman, editor Anita Chao, director of photography Ivan Abel, gaffer Michael Yetter, key grip Jeremy Rodriguez, art director Elise Ferguson, fabricators/sculptors Ben Kress, Michael Lawrence, facbricators Tim McDonald, Peter Erickson, Jacob Dyrenforth, Hayley Morris, Michaela Olsen, animator Matt Somma, previs artist Lukas Wadya, animators Mike Luzzi, Mark Pecoraro, compositors Peter Fink and Allison Kocar. Music was by Huma-Huma. “Outside Car” was directed by Wethinkthings (Felix Meyer and Pascal Monaco) via Sehsucht, Hamburg, and Rokkit, London, with producers Selina Schmitt and Tom Knight, creative director Hans-Christoph Schultheiss. Music is by Nikolai von Sallwitz.